How do I place in this post the photo of the car’s license plate I just took? My experience is that they’re too ‘big’. You have to run them through an app first or I think you can make adjustments to your phone before you take the pic but then they come out blurry(?). I looked into it at the local Verizon store and got an ‘ I don’t know’. PG knows. I saw her answer this question buried in the posts somewhere in these forums. I think the easiest way is to first out it somewhere on the Internet (FB, Instagram), then simply paste the link into the body of the post. I think the forum software will then convert it when you hit “submit reply”, and we will all see the link as a picture. What was the final decision on your license plate??? im going to let my stealie do the talking for me for now. Decided to continue to not advertise beyond that..haven’t bought the new car yet. Can’t decide on color! Lol. Nice! I saw that exact tag but Delaware, decades ago at this point. So I was tinkering around with the DMV site again for a new idea and see that my original entry at the top of this thread, S2M8DIZ, is now not available here in California. I was amused and slightly “e-violated” hahaha. I’m glad it’s in use, as I wasn’t going to use that one, but it would have been nice to not have it taken without a pm and asking if it was cool to take, considering it was likely discovered here. My attorneys will be in touch. Did you try to switch the Z for an M? It might be an innocent reason why it’s not available. I’m not so sure they approve just anything. I’m also not sure if you had already been preapproved on that one. It is a good one. I deciphered it just the other day. Estimated/eyes, right? Also if stolen from someone that found it here on the inter webs I would bet it wasn’t an actual member that could PM you. I said some comments that referred to kids there to party or some attitude of that sort as phish kids. We had new members the next day to school me on the phish scene. This website gets trafficked by trolls and non members. However your lawyer might break your heart when he lets you know when you post something on a forum you lose the ownership of your intellectual property. I’m no lawyer so I don’t know but I don’t think you it’s much of a crime to steal ideas on the internet. I can’t resist. Is he the victim or the crime? I'm going with one major coincidence - Cali is the #1 national hotbed for anything vanity-related. They had two stickers on the windows, both were GD. 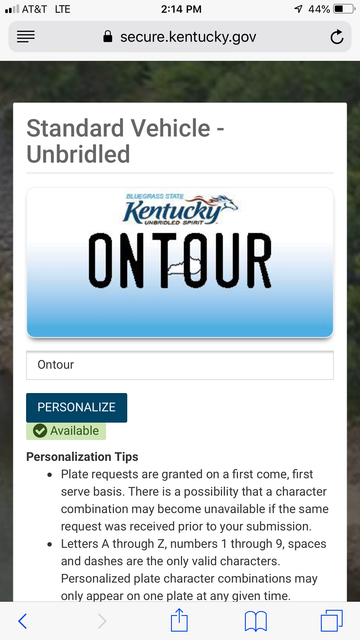 I suppose it could be a coincidence that in the month or whatever since I started this thread that someone has since claimed and used that plate, but I strongly doubt it. They’ve had forever up to now, but after I post it, it’s gone? Nah. I haven’t tried any other spelling of it. Not really sure why I checked it in the DMV site at all, as I wouldn’t be using it even if it were still available. Perhaps a silent premonition? I do have another one that is a play on something cool and the specific car that I’m getting that I may use. I’m obviously not putting that information here though now, haha. And I was joking about the lawyer part. I was slightly offended that someone took it, as well as amused at humanity’s assholedness, but this is obviously wholly unimportant. Just thought I’d share what happened with you friends.